I teach a master’s level class on international human rights. The other day we were discussing the brilliant new (2013) book by Alison Brysk, Speaking Rights to Power, which analyzes how you can get particular human rights abuses on the international agenda. One way is to have an appealing symbol of a human rights cause, and in that connection the name of Malala Yousafzai came up. Malala is the 16-year-old Pakistani girl who was deliberately targeted and shot in the head by the Taliban a year ago (2012) because she was a vocal defender of girls’ right to education. Malala was brought to Britain for free medical treatment and now goes to school there. Everyone knows of Malala. She won the 2013 European Union Sakharov Prize (named after the famed Soviet-era dissident Andrei Sakharov), and was nominated for the 2013 Nobel Peace Prize. She’s a heroine of the international movements for girls’ rights and the right to education. And so she should be. I have no patience with people who say she’s only a heroine because she fits in with the “Western” anti-Taliban narrative. Plenty of people in Pakistan detest the Taliban, as do people in Afghanistan. The Taliban use violence to subordinate women to men. But as one of my students pointed out in class, there is a certain selectivity in lionizing Malala and not even noticing other Pakistani girls who suffer, especially girls who suffer because of US foreign policy. One policy that has a lot of human rights activists worried nowadays is the US use of drones to kill alleged terrorists in Pakistan and some Middle Eastern countries. 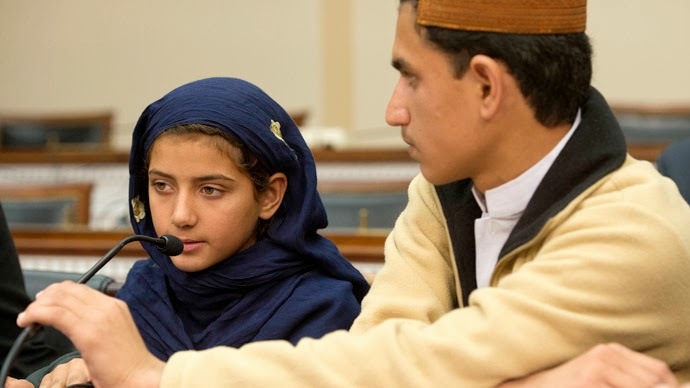 On October 24, 2012, eight-year-old Nabila Rehman was in a field in North Waziristan, an area suspected to harbor many Taliban terrorists, with her grandmother Momina Bibi, a midwife. Ms. Bibi was teaching Nabila how to recognize when okra were ripe enough to pick. Suddenly a US drone appeared overhead, there was a dreadful noise and a flash of two lights, and Ms. Bibi was dead. Nabila and her older brother Zubair were injured, Zubair quite seriously; their younger sister lost some of her hearing. And there was no free medical care for Nabila and her injured brother, as there had been for Malala. Like many other children in the region, Zubair no longer wants to go outside, even to play cricket. Many children in the region can’t sleep because of fear of drone attacks. In October 2013 Nabila Rehman visited the US Congress with Zubair and her father, a teacher. The visit was organized in part by a British non-governmental organization called Reprieve. Her lawyer, Shahzad Akbar, who represents many victims of US drone attacks and is a director of a Pakistani human rights group called Foundation for Fundamental Freedoms, was not allowed to accompany them. The visit was organized by a Democrat US Congressman, Alan Grayson, but only he and four other Democrats showed up to hear Nabila speak. I used to really admire Barack Obama: I went so far as to put an Obama bumper sticker on my car before the 2012 election, even though I’m Canadian and live in Canada (against my husband’s advice: he said I wouldn’t be able to get it off my car if I wanted to). Perhaps I was caught up in the “thank-god-he’s-not-George W. Bush” euphoria that caused the Nobel Committee to give Obama an undeserved peace prize in 2009. But unless the US has a secret agreement with Pakistan to attack alleged terrorists with its drones (bring back Edward Snowden, so we can find out!) Obama is now permitting military violation of a sovereign state. He’s also engaging in extra-judicial executions, as Amnesty International has pointed out. So why isn’t the world paying more attention to Nabila Rehman? 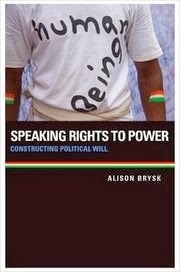 According to Alison Brysk’s analysis, social movements need to have voices. Witnesses are one such voice, and Nabila is certainly a moving witness; even her translator was in tears when she visited Congress. Brysk also says human rights movements need to cultivate audiences, learn how to use mass media, and learn how to “perform” a human rights narrative. There’s lots of information about Nabila and her family on the Internet, but the audience seems to still be pretty small. The performance in the US Congress failed, because hardly anyone showed up. I think my student is right: even if there is every reason to admire Malala, other Pakistani girls, killed by the US rather than by the Taliban, deserve just as much sympathy and support. Nabila is one such girl.